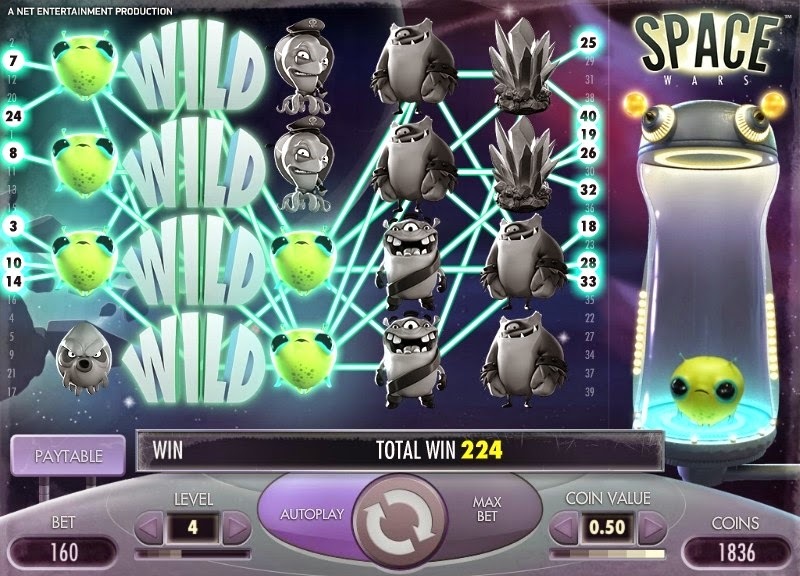 Space Wars is a Net Entertainment powered video slot with 5 reels, 4 rows and 40 paylines. 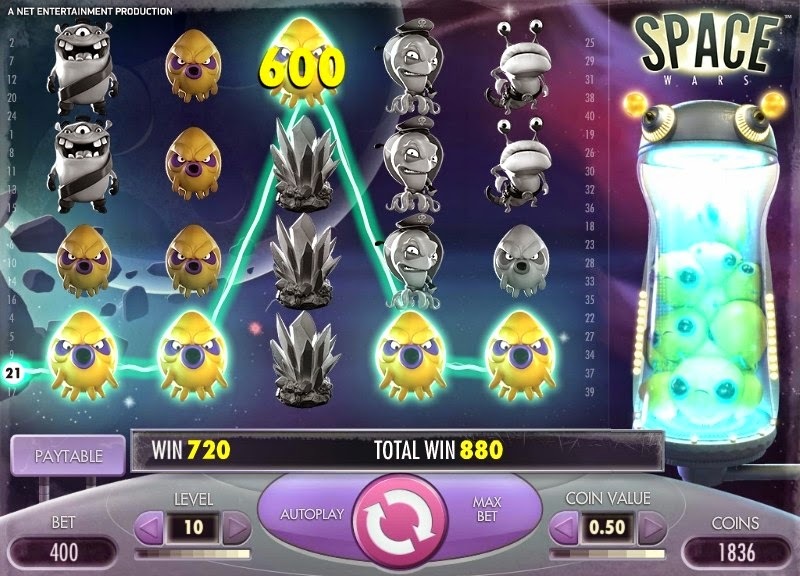 Players are introduced to the theme of the game through an animated intro movie that will help them get into the game and help them identify the different alien races taking place in the game. In Space Wars we get to follow the war between 5 species of aliens. Net Entertainment has carefully designed aliens that will have you smile and frown at the same time. They are cute enough to make you adore the game but vicious enough for you to relish deporting them from the screen in the little beamer “teleporter” box to the right of the reels. 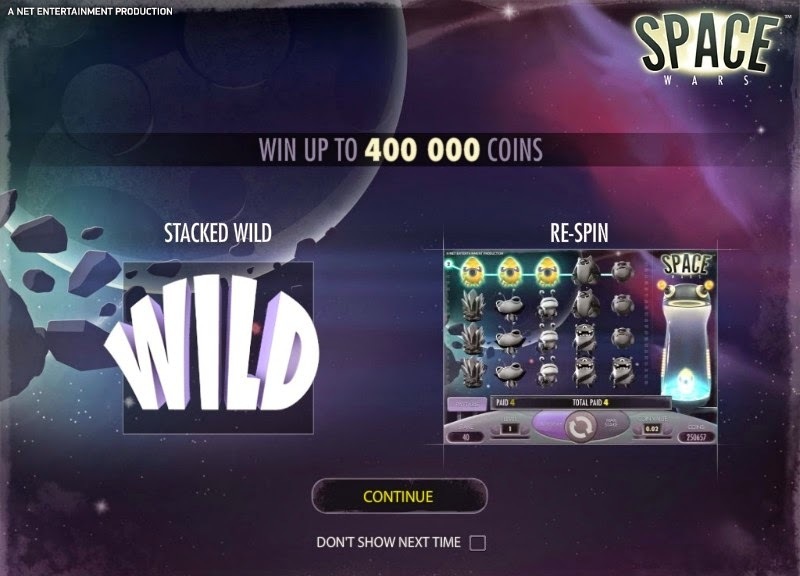 This is not the first space themed slot machine from Net Ent but it is one of the finer ones with details that make the reel really draw you into the action. 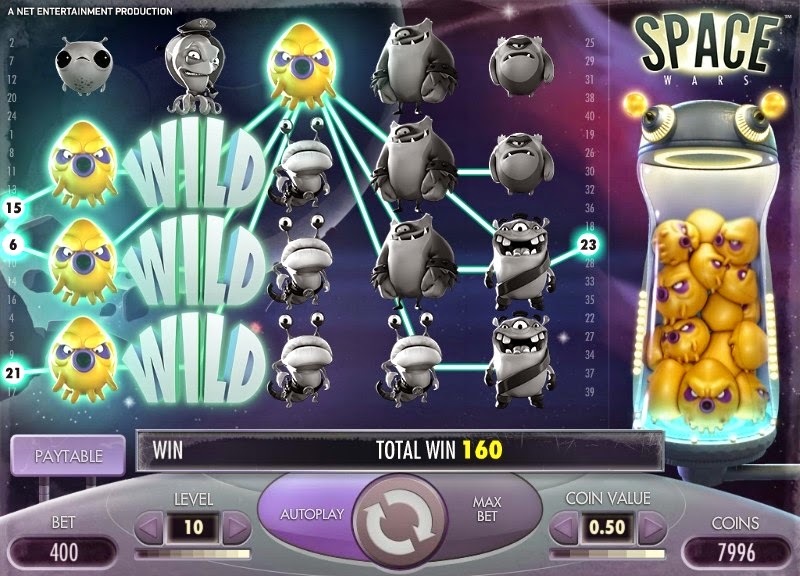 Space Wars has no free spins feature which is disappointed but benefits from a Cloning Pod Re-Spin feature – this is innovative and completely unique in that when you getting a winning combination on a payline, the winning symbols show up in the Cloning Pad (on the right hand side of the reels). 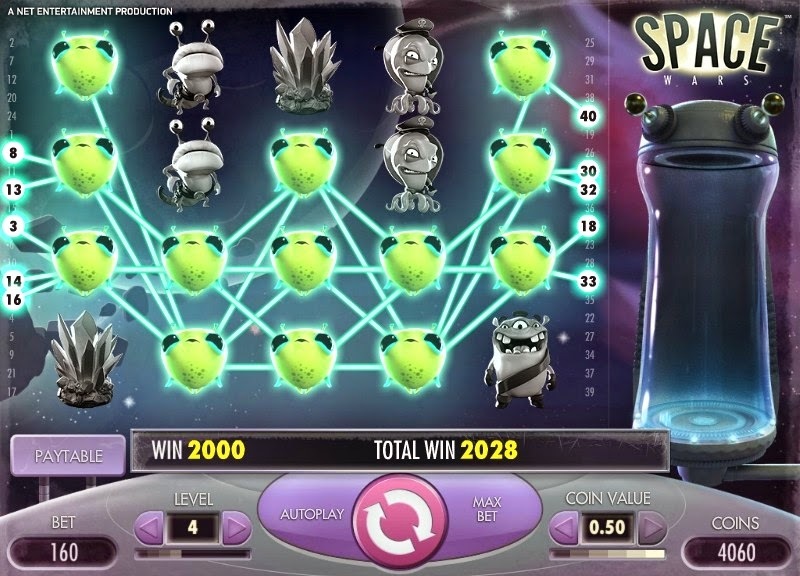 Players will earn great line payouts if they succeed in matching adjacent aliens, a minimum of 3, on one of the paylines of the game. The highest line payout is paid to players who get 5x red alien symbols on a payline; this reward is equal 1000 coins. In fact, most individual wins are fairly impressive, relatively speaking against the norm. 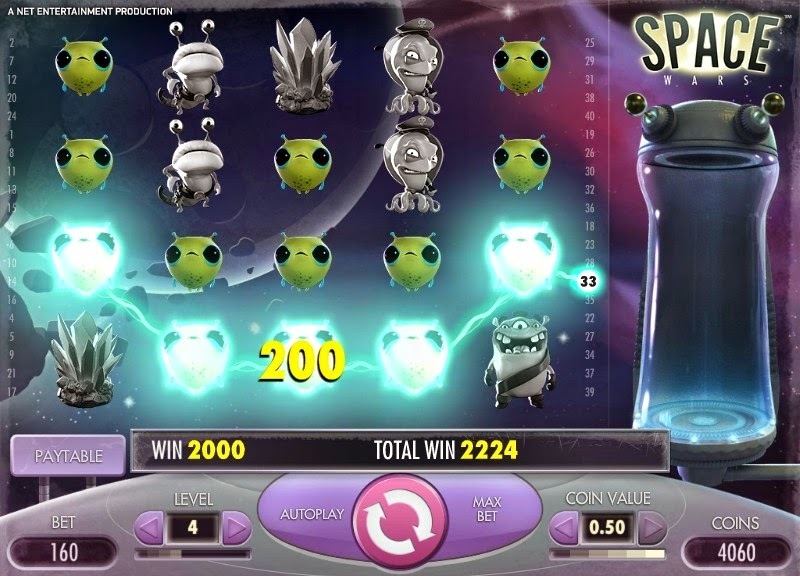 For a non-traditional progressive slot, Space Wars certainly pays out well. Apparently, the galactic economy is generally better than Earth’s.